In the late 400s and early 300s B.C., Greek grave monuments sometimes took the form of a large lekythos. The usual lekythos was a small terracotta vessel used to hold oil for funerary rituals, but the shape was monumentalized and translated into marble for use as a grave marker. 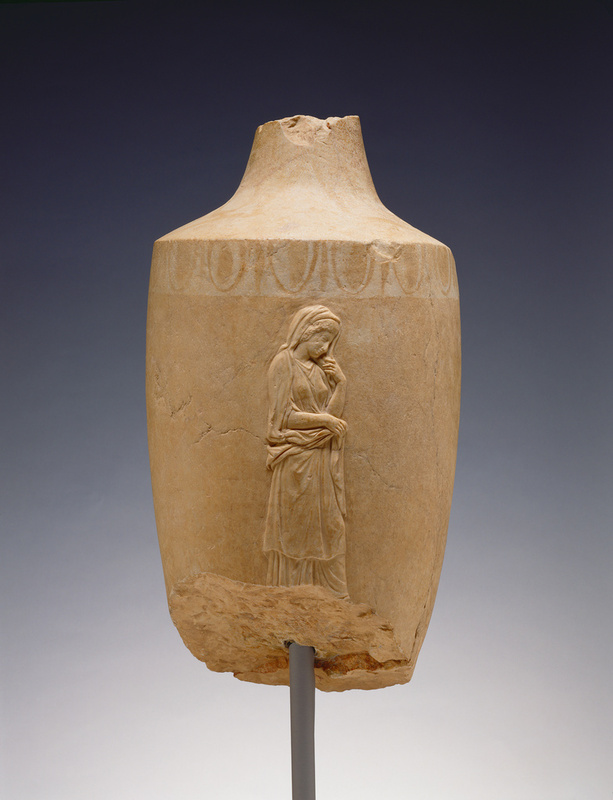 Only a fragment of this marble lekythos survives. Originally, it had a cylindrical body resting on a small foot, and a tall neck rose from the body of the vessel. Marble grave lekythoi were usually decorated with a scene carved in relief on the body of the vessel. The unknown sculptor of this piece has depicted a woman shown in three-quarter view. She draws her cloak over her head in a gesture usually associated with brides. This mixing of bridal and funerary imagery is not uncommon. In Greek thought, dead maidens were believed to go to the underworld and become brides of Hades. Traces of a painted pattern are still visible on the shoulder of the lekythos. Most marble lekythoi had floral patterns, similar to those found on terracotta lekythoi, painted on the shoulder. Parts of the carved relief may also have been accentuated with paint. Milton Gottlieb and Pat Gottlieb (Los Angeles, California), donated to the J. Paul Getty Museum, 1980. The J. Paul Getty Museum Appointment Calendar (Malibu: J. Paul Getty Museum, 1981), week of May 4. Clairmont, Christoph W. Classical Attic Tombstones. (Kilchberg, Switzerland: Akanthus, 1993), vol. 1, pp. 252-53, no. 1.189. Grossman, Janet Burnett. Greek Funerary Sculpture: Catalogue of the Collections at the Getty Villa (Los Angeles: J. Paul Getty Museum, 2001), pp. 71-73, cat. no. 25. Spivey, Nigel and Squire, Michael. Panorama of the Classical World (Los Angeles: Getty Publications, 2004), p. 19, fig. 19. Lapatin, Kenneth. "Materials and Techniques of Art." In The Oxford handbook of Greek and Roman art and architecture. Marconi, Clemente, ed. (New York: Oxford University Press, 2015), pp. 215-6, fig. 9.6. Brinkmann, Vincenz., Renee Dreifus, and Ulrike Koch-Brinkmann, eds. Gods in Color: Polychromy in the Ancient World, exh. cat., Fine Arts Museums of San Francisco, Oct 28, 2017–Jan 8, 2018 (Munich: Prestel; London: DelMonico; San Francisco: FAMSF, 2017), p. 150, no. 63.